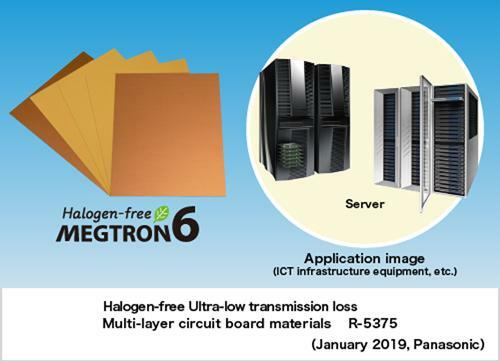 Osaka, Japan – Panasonic Corporation announced today that it has commercialized halogen-free, ultra-low transmission loss, multi-layer circuit board material, called Halogen-free MEGTRON6 (Representative part number: R-5375), suited for communications infrastructure equipment such as fifth-generation (5G) mobile communication systems. Production will begin in April 2019. With the upcoming launch of 5G mobile communication system services, greater-capacity and faster data transmission speeds will be needed. Multi-layer circuit board material used as a key component in equipment such as servers and routers that support core systems for communications networks will require halogen-free material from the viewpoint of environmental protection, not to mention high-capacity and high-speed data transmission. Panasonic has commercialized this multi-layer circuit board material that is ideal for communications infrastructure equipment by achieving a halogen-free material that shows low transmission loss, high heat resistance, and high reliability, based on the company's proprietary resin design technology and compounding technology. 1. Halogen-free material with a low transmission loss characteristic, contributing to higher-capacity and faster data transmission. Communications infrastructure equipment for ICTs, high-end servers, routers, switches, wireless base stations, etc. This material will be exhibited at “DesignCon 2019” to be held from January 29 to 31, 2019 in Santa Clara, California, USA. This material, created using the company's own resin design technology and compounding technology, offers excellent reflow heat resistance, insulation reliability, and high glass transition temperature as well as a high thermal decomposition temperature. This multi-layer circuit board material achieves high reliability in high-temperature environments, thereby contributing to reliable operation of communications infrastructure equipment. This material achieves outstanding ease of manufacturing and processing in producing multi-layer circuit boards with over 20 layers based on the company's own resin design technology, and enables the adoption of environment-friendly halogen-free circuit board material in communications infrastructure equipment that requires very high numbers of board layers. Material defined by JPCA-ES-01-2003 concerning the quantity of halogens (bromine [Br] and chlorine [Cl]) present. The decay phenomenon of an electrical signal in a circuit due to being converted to heat by resistance, etc., in relation to distance or circuit design. The degree of loss varies according to the characteristics of the conductor (circuit) or the insulating material (board material) in contact with the circuitry. Dielectric constant is an index of the ease of polarization of an insulating substance when an external charge is applied to it. Each substance has a specific value. Because easily-polarized substances tend to store electricity, hard-to-polarize substances (small dielectric constant) are better for efficiently sending electrical signals. The dielectric constant is defined as a ratio relative to the dielectric constant of a vacuum. Dissipation factor indicates the degree of loss that takes place when electricity stored in an insulating substance is discharged. The smaller the dielectric dissipation factor, the more efficiently stored electricity is discharged, and the smaller the transmission loss of the electrical signal becomes. When a polymer is heated, it changes from a glass-like hard state to a rubber-like, soft condition. This change is called glass transition, and the temperature at which this change occurs is called the glass transition temperature. Panasonic Corporation is a worldwide leader in the development of diverse electronics technologies and solutions for customers in the consumer electronics, housing, automotive, and B2B businesses. The company, which celebrated its 100th anniversary in 2018, has expanded globally and now operates 591 subsidiaries and 88 associated companies worldwide, recording consolidated net sales of 7.982 trillion yen for the year ended March 31, 2018. Committed to pursuing new value through innovation across divisional lines, the company uses its technologies to create a better life and a better world for its customers. To learn more about Panasonic, visit: https://www.panasonic.com/global.